Departure Points: Paris or anywhere from Normandy. Honfleur and Rouen Tours Include: Private transportation, services of guides including a local expert guide for the city of Rouen, taxes, tolls and parking. 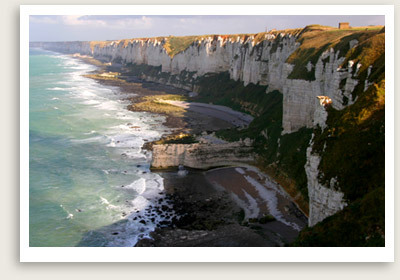 Your private tour of Upper Normandy begins with a private tour Honfleur, a charming port town. At the heart of Honfleur, the old dock is full of character, from its old slate-fronted houses to the art galleries and cafes located in converted salt stores. Eugène Boudin and Claude Monet were among the famous impressionist painters who drew inspiration from Honfleur’s port. You will visit a few sights in town, perhaps St. Catherine’s Church, which is the largest wooden church in France, built by the town’s shipbuilders in the late 15th century. The Eugene Boudin Museum, set in a 19th century chapel, is also of interest. Honfleur’s farmer and flea markets are also fun places to stroll and shop (time permitting). Next is your Rouen tour, capital of Upper Normandy since Roman times. Your private local guide will take you on a stroll through the medieval town. Here you will get a close look at the House of the Exchequer, the 15th century Archbishop Palace, and the splendid Renaissance Palace of Justice. You will also stop for a photo of Rouen’s most popular monument: the Grosse Horloge, a clock from 1527 with its superb dome-crowned belfry. You will stop at the Place du Vieux Marche (Old Market Square), where the martyred Joan of Arc was burnt at the stake. Finally you will have a privately guided visit of the Notre Dame de Rouen Cathedral, one of the most beautiful examples of French Gothic, immortalized over 20 times by Claude Monet.